Blanket forts are so much fun! You can never be too old to enjoy one. 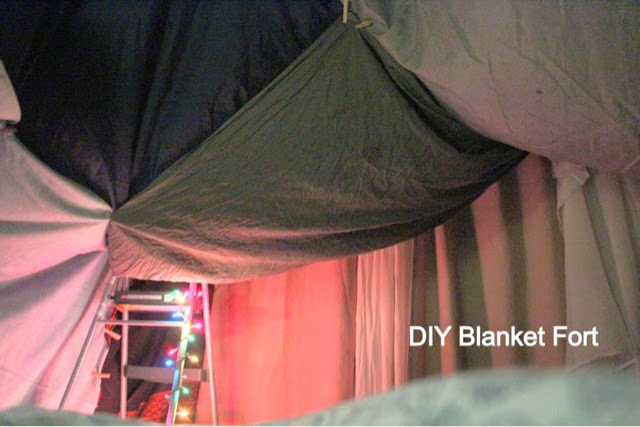 Better yet, there are loads of ways to make your grown up blanket fort work for you. The Canadian and I recently celebrated two whole years of marriage. Neither of us feel that our anniversaries need extravagant gifts or plans. After we married, we agreed to ensure that our anniversaries would turn into special dates, whereby we would do something together, rather than buy something for each other. In a way that’s similar to our outlook on Valentine’s Day, we are of the opinion that if we need to focus on one day a year, we’re not doing it in a way that works for us. After scouring and reviewing the North American and British wedding anniversaries, we decided to follow the British traditions. This year marked the second year and, as such, the cotton anniversary of our marriage. We spent the day with immigration Canada – not the best place to spend it! After what was a stressful day, we had a BBQ with some family and, once everyone had left, we built a blanket fort, because blankets are cotton, yup nothing gets past me. Few people were as excited or as amused by our plan to build a blanket fort for our anniversary but we still loved it. It was juvenile, fun and exciting. The best part about it is that we are both nerdy people, we enjoy building things and its a unique shared experience for the memory bank. We also got to work as a team and building a blanket fort, to us, was a brilliant way to spend a cotton anniversary. We planned our blanket fort so that we could sleep in it, watch Doctor Who (didn’t I say nerdy already? ), and eat our favourite finger foods. We pulled the mattress into the room and set it down next to the sofa, we placed ladders, side tables and chairs around the mattress and pegged the blankets around them, all the fabrics were light weight, and the entire fort was supported by the ceiling fan and the curtain rods, all through the use of handy pegs (be sure that the fabric is not heavy if you are using light fixtures. 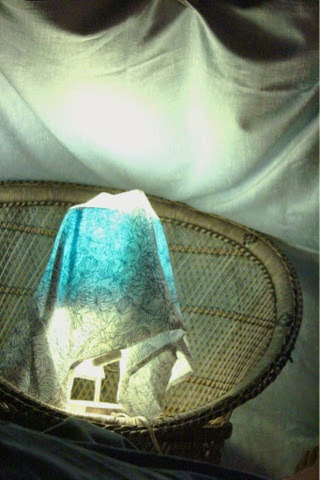 Secure it very loosely, if you tug on the blankets, it’s better for the fort to collapse rather than the light fixture land on your head!). We filled the fort with fairy lights and voila! 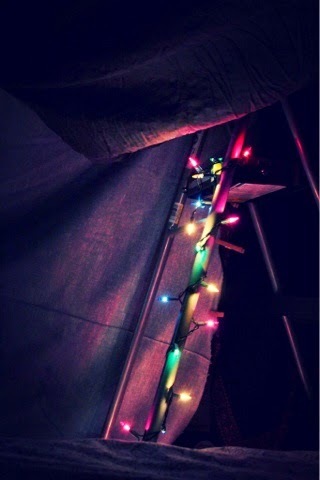 Our fort was complete. It lasted 5 days, until the cats managed to get in and have fun with it! ~ collect all your blankets, sheets, spare fabrics, duvets, pillows and scarves in one place. ~ pegs, lots of pegs! And maybe some safety pins. ~ be wary of fire hazards, blanket forts and flames do not mix well. What so you think, is there a blanket fort in your future? 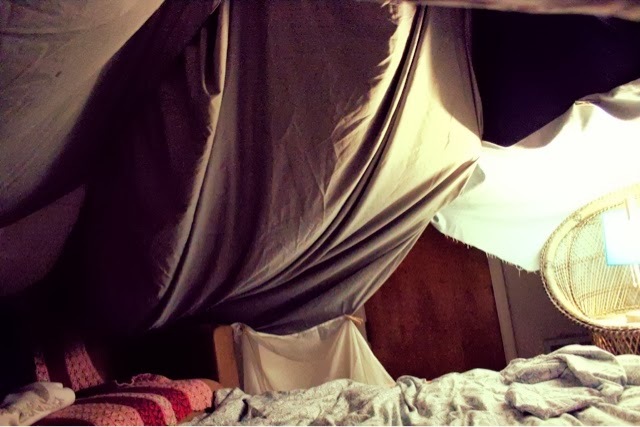 Have you ever built a blanket fort for grown ups?